‘Real’ jar mayonnaise is made with a high oil content which is mixed with water, eggs, and vinegar to produce a delicious, creamy dressing. The eggs act as an emulsifier, while the vinegar acts as a preservative. Flavours such as mustard and garlic are then added. 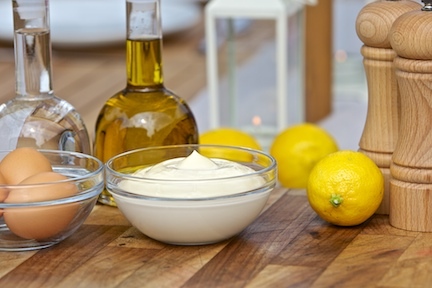 This traditional approach to making mayonnaise is high in fat and high in energy. Mayonnaise’s popularity stemmed from its ability to allow high quantities of energy rich oil to be consumed in a palatable way, especially when spread on food. Traditional mayonnaise generally has an excellent shelf life due to the low water activity and pH. This makes it suitable for long life storage in jars, hence jar mayonnaise. The traditional method of whisking oil into egg and water has, been replaced by vacuum manufacturing which excludes air and avoids the risk of the mayonnaise turning rancid. Traditional jar mayonnaise is very high in calories but the creamy, thick taste and texture is still highly regarded by restaurant chefs and sandwich manufacturers. Most chefs, however, don’t have the time (or energy) to freshly prepare mayonnaise so many buy pre-manufactured versions in plastic buckets. For the manufacturer, however, oil and eggs are costly ingredients. So new products, which duplicate the taste and texture but lower the use of these expensive raw materials, are constantly evolving. Our technical team will be happy to discuss your requirements, and how we can help you develop better new products which meet the demands of your customers. Traditional jar mayonnaise is a simple product but problems can occur during manufacture. The most significant potential issues are emulsion breakage, overheating and variable viscosity. Overheating is more likely in the summer months when water is warmer. KaTech can help you avoid each of these potential problems to produce the best possible product. Our troubleshooting experts are here to solve your production and process problems. There are a number of ways in which KaTech can help you produce a better mayonnaise for less. Traditionally mayonnaise is made from oil, water, vinegar and eggs. The oil and the eggs are the mostly costly of these ingredients and their prices are extremely volatile and difficult to predict over the contract period. Adjust viscosity – allowing for a faster flow through the coolers releasing extra production time. Contact us today to see how we can cost optimise your ingredients and production process.